An innovative way to find fridge space you didn’t even know you had! This post is sponsored by BevStow. Get it for 25% off on Amazon with the code “25OFFBEVSTOW”! 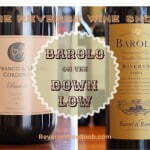 As much as you love wine, finishing an entire bottle in one sitting isn’t always feasible. 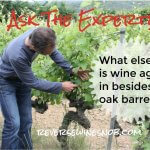 Fortunately, it’s fairly simple to preserve the freshness of an opened bottle for several days, giving you time to prolong your enjoyment of the wine. 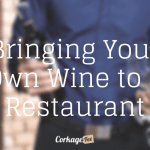 The best way to keep an open bottle of wine fresh is by recorking it with the same cork that came out of it, then putting it in the fridge (yes, that includes red wines, too). The cooler temperature in the fridge will help slow down the oxidation process, leaving your wine drinkable for longer period of time. 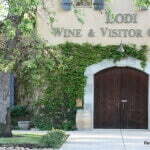 When properly recorked and stored, white wine will stay fresh for approximately 5-7 days, red wine about 3-5 days. (Don’t forget to take the red wine out of the fridge and leave it on the counter for about an hour to bring it back to room temperature when you’re ready to drink it). But keeping an opened, unfinished bottle of wine in the fridge can be a bit of a challenge. To prevent air from getting in, the cork needs to be kept moist. The moisture causes the cork to swell, allowing it to fit snugly into the neck of the bottle and block air from getting to the wine. The best way to do this by laying the wine bottle down on its side. But if you’ve ever tried to store a bottle of wine horizontally in the fridge, you’ve probably run into some issues. The bottles have a tendency to roll all over the place, getting in the way, and taking up valuable space meant for your food. Even if your wine bottle has a screw top (which is better at blocking air and also doesn’t need to be kept moist), storing it in the fridge can still be a pain. Wine bottles are often too tall for the vertical space in your fridge. They tend to lean to the side in very inconvenient ways, even when placed in the door shelves. And, again, that’s taking up the space meant for your food. Luckily, there’s an easy fix to the fridge space problem: BevStow. BevStow is a beverage storage solution that uses the “dead space” in your fridge to your advantage. 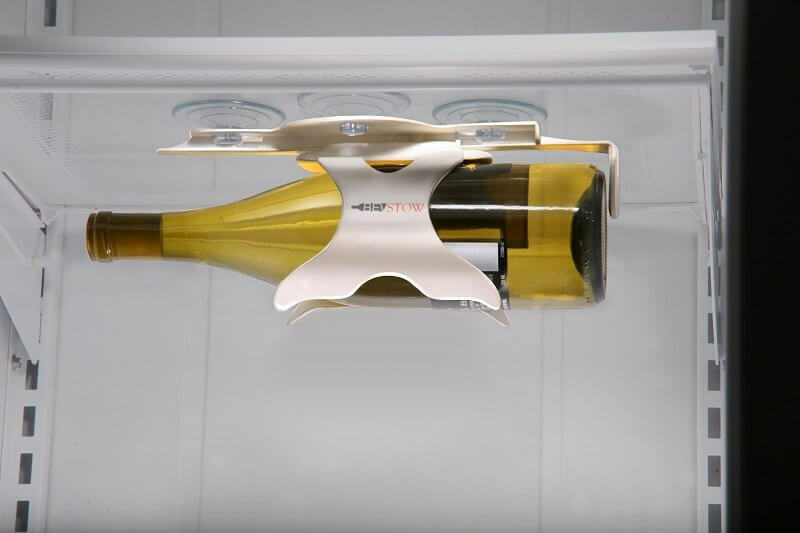 It attaches to the underside of the glass refrigerator shelves with powerful, extra-strength suction cups that can hold up to 10 pounds for long periods of time. Because it’s using the space above your food, wine bottles can be stored on their side, keeping corks damp and air out. BevStow also stashes the bottles out of the way – and out of the door. No more rolling, tipping, in-the-way bottles. 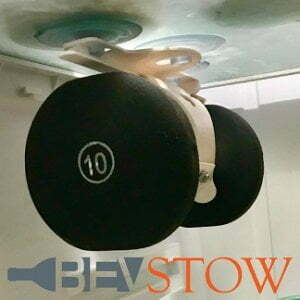 Installing a BevStow is quick and easy, plus you can move it around from one shelf to the next without a problem. And the best part? BevStow isn’t just for wine. Any beverage can be stored in a BevStow! Once you’ve finished that bottle of wine, your favorite beverage can take its spot, freeing up space in your fridge. No more in-the-way bottles? 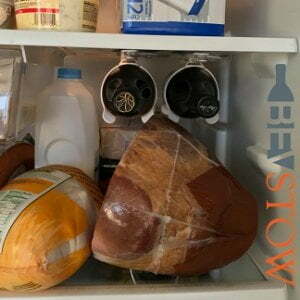 Finding extra space in your fridge? We’ll toast to that!